Political troubles not withstanding Iraq should be a rich country, and one with the trappings of its neighbours which includes supertall buildings. Bearing this in mind the forward looking Provincial Council of Basra has hired Mott MacDonald to come up with a feasibility study for a city district that includes a 240 floor building that would be the tallest building in the world. Dubai might be famed for its skyscrapers but visitors to the city will tell you that much of it remains empty dust-covered lots. One of these could soon see a supertall proposal, one of the first since the 2008 financial crash that has seen the previously growing skyline reach a state of stasis. As the emirate motors back to economic health, more luxury towers are planned in Dubai for the Central Dubai development by Al Habtoor including a couple of new supertalls. Signs that Dubai could finally be emerging from its real estate slump continue with the proposal of twin supertall luxury towers. Izmir, one of the largest cities in Turkey, could soon be set to receive its first supertall skyscraper, the 358 metre tall Highlife Tower. Two major British construction companies have had a big win securing contracts on what will be the next tallest building in the world, The Kingdom Tower. Playing on hexagonal shapes and hexagons is a new residential tower in Istanbul with the excitable name, Hype 2. 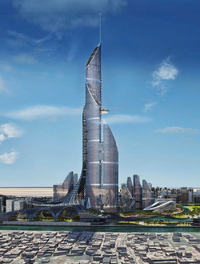 It seems almost unbelievable, but the Kingdom Tower in Jeddah could actually happen. The thousand metre plus building will however take a serious amount of high-tech engineering to get it to stand up and beat the current title holder, the Burj Khalifa by at least 173 metres. Perhaps one of the best examples yet that the residential market in Dubai is leaving recession and starting to expand again is the news that DAMAC Towers by Paramount is selling far ahead of expectations. Anadolu Plaza in Istanbul is the latest in a series of proposed office towers to stand overlooking the major D100 motorway. Skyscrapers can be a sign of reconstruction, rising out of the ruins of war. With Iraq now in something approaching a state of stability Pritzker Prize winning Iraqi born British architect, Zaha Hadid, has been working on her first high-rise commission for the country. Plans are afoot for the Trump empire to extend its reach to the Black Sea resort of Batumi, Georgia with a newly proposed 180 metre tall Trump Tower.